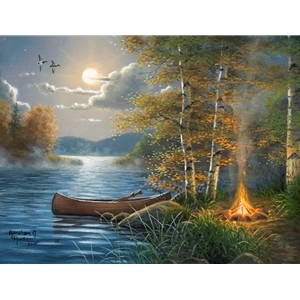 On a misty Fall evening deep in a hardwood forest, the moon begins to cast its gentle rays through the canopy of leaves and softly glistens of the water as it laps against the shore. The campers are probably out gathering more firewood to keep the fire going well into the night. There will be s'mores made from roasting marshmallows over the fire and guitar playing to warm the heart and stir the soul. I've tried to capture this moment in time for you to enjoy for ever. I hope Moonlit Camp blesses you with its message, and that you never take for granted all that Our Creator as so graciously given us..